Scientists and health workers are racing to contain a malaria strain along the Thai-Cambodia border that is becoming increasingly resistant to Artemisinin, the best drug available to fight it, experts say. Artemisinin, normally used in a combination therapy (ACT), has given hope in recent years that malaria can be eradicated worldwide. But a key trial in western Cambodia in 2007 and other evidence has shown a tolerance to Artemisinin in the Plasmodium falciparum parasite, which causes the most deadly form of malaria. “To prevent the spread of this [parasite], we need to be fast,” said Eva-Maria Christophel, a medical officer specialising in malaria and other vector-borne diseases with the World Health Organization’s (WHO’s) regional office for the Western Pacific. These efforts received a boost recently with a US$22.5 million grant from the Bill and Melinda Gates Foundation to the WHO. “A big containment effort will now start … and maybe to try to eradicate malaria from western Cambodia to get rid of the problem,” said Arjen Dondorp, deputy director of the Wellcome Trust-Mahidol University-Oxford Tropical Medicine Research Unit (MORU) in Bangkok. “It’s sort of a timebomb, so you never know when the parasite is going to escape from western Cambodia and spread to the rest of the world,” he said. Experts are monitoring if ACT is becoming less effective in other areas, such as the Thai-Myanmar border. MORU, with a global consortium of scientists, is also trying to find out how and why the falciparum parasite is becoming tolerant to Artemisinin. Tolerance has been connected to the consumption of suboptimal doses of the drug, which do not kill the parasite. This can be due to counterfeit medicines or patients not fully following treatment regimes. Artemisinin monotherapy, where the drug is taken alone - allowing parasites to more easily adapt to it - is also a significant factor. ACTs are still extremely effective. However, evidence shows that Artemisinin as part of a combination therapy is starting to work later than normal, taking more than a benchmark three days to get rid of parasites. “We are trying to find out the biological basis for that resistance,” said Dondorp. Health authorities and NGOs in Cambodia and Thailand are now trying to contain the parasite by treating all malaria cases and preventing its spread. A major challenge is working with mobile and migrant populations, which could spread the Artemisinin-tolerant parasites. These populations in the border area include settlers, Cambodians who work in plantations and orchards in Thailand, and loggers who spend extended periods in Cambodia’s forests. In Thailand, which has a long-established malaria control programme, the government has created a national task-force to contain the parasite. “We started in January to set the meeting of the national task-force for containment, and after the national task-force has met, we will launch the project,” Wichai Satimai, director of the Bureau of Vector Borne Diseases at Thailand’s Ministry of Public Health, told IRIN. “The pattern of resistance is mostly from the east next to Cambodia, to the west, next to Myanmar. And we are quite worried about the control measures in nearby countries,” he added, citing previous experiences of emerging resistance to other anti-malaria drugs. 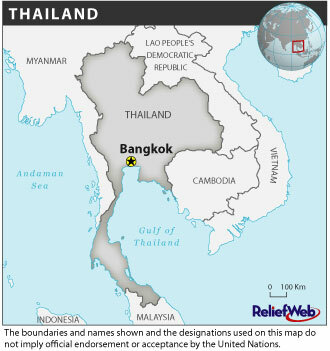 As part of control efforts, Thailand has established 500 malaria clinics. It also has 460 malaria posts with support from the Global Fund to Fight Aids, Tuberculosis and Malaria, where villagers are trained to detect the disease and provide treatment, Wichai said. In Cambodia, a ban on Artemisinin monotherapy will be enforced by mid-year. Meanwhile, authorities are stepping up efforts to fight counterfeit drugs, Christophel said. There are also plans for all villages in affected areas to have a malaria volunteer equipped with diagnostics and the right treatment. “The thing is to now accelerate and speed things up, that’s clear,” said Christophel.